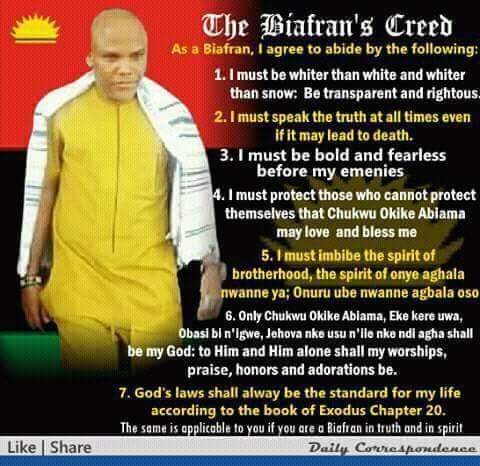 This is to inform the entire Indigenous people of Biafra (IPOB), that reputable Human rights organisations shall be storming Federal High Court Abuja, on the 10th of January 2017 to monitor court proceedings of the case involving the Federal government of Nigeria and Nnamdi Kanu. Also to witness the case are renowned International Medias and Foreign Observers designated to monitor Binta Nyako's attitude and pattern in which she intends to carry out her nefarious plan to conduct secret trial which Nnamdi Kanu has bluntly opposed during the last session. We at Biafra Writers in conjunction with the leadership of IPOB are urging every Biafran from far and near to storm Abuja for this purpose. We are also using this medium to urge business men and women residing both within and outside Abuja to dedicate that very day in honour of our leader who has paid so much sacrifice that we may have the freedom we dream of. January 10th is a date we must all show solidarity to Nnamdi Kanu, a day we stand fearless in the face of evil, a day we send a message to Buhari's new puppet, Binta Nyako, that the court is not hers and she cannot do as she pleases, a day we say to Buhari... enough is enough, we must display our resolve to never allow Kanu and others be jailed secretly in exchange for the freedom of Binta's thieving husband, Murtala Nyako and son, Aziz Nyako. Biafra Writers stand with Nnamdi Kanu....what about you?